The State Department is methodically digitizing old policy statements for presentation in the online version of Foreign Relations of the United States (FRUS). My original photocopies are speckled, redacted, and huge. I will replace speckled photocopies (pdf or jpg) with links to FRUS (html) as they become available. Worthy of note is that the first term of the Truman administration established the framework for covert operations and intelligence infrastructure. For a focused collection of documents provided in FRUS, see Emergence of the Intelligence Establishment 1945-1950 html and its subset on Psychological and Political Warfare html. See also NSC Intelligence Directives 1947-1950 html. Truman initially rejected the aggressive NSC 68 (Nitze) over budgetary concerns but adopted it soon after the invasion of South Korea. It was rescinded toward the end of the administration having been found to be too expensive to sustain and was replaced by a more political than military strategy (Kennan). From the earliest Cold War, covert preclusive buying was considered to prevent certain materials from falling into the wrong hands. Over the years, materials included Congolese uranium, Chilean copper, and Cambodian rice. Perhaps what is most noticeable in the Eisenhower administration is the perpetual, cyclic review of national security policy to keep up with continuously changing geopolitical conditions. It’s all part of the “policy hill” process. Also noteworthy is the attention paid by the administration to development of the information instrument and the US Information Agency. The record is thoroughly presented in a FRUS compendium html and html. From FRUS overview “Leading Kennedy administration policymakers in the White House, the Department of State, and the Department of Defense, but not the President himself, worked to frame a basic national security policy (BNSP), which would replace NSC 5906/1 of July 1959, the last such statement of policy in the preceding administration. 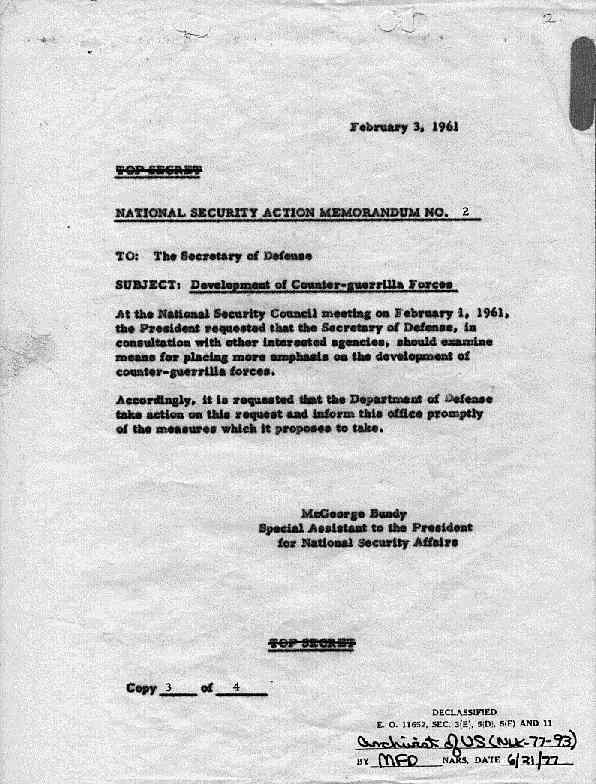 While he had little interest in an umbrella BNSP paper, President Kennedy did from time to time set forth a multi-subject overview of U.S. policy, either in the full NSC meetings or with the Joint Chiefs of Staff.” The links below are to photocopies of BNSP drafts that were circulated but never signed into policy by the president. The world Nixon inherited as president differed considerably from the one he experienced as vice president under Eisenhower. Eisenhower had a near nuclear monopoly and planned accordingly. A major issue for the Kennedy administration was counterinsurgency policy, and the Johnson NSC was consumed by counterinsurgency in Vietnam. During the JFK/LBJ era, the Soviets reached nuclear parity and China began to look like a nuclear threat as well. The Nixon NSC spent considerable time dealing with strategic nuclear force issues and trying to distance his administration from counterinsurgency. The documents on strategic nuclear forces are too numerous to mention here, but they are accessible in the administration’s NSSMs and NSDMs. The Nixon presidential library provides all declassified National Security Study Memoranda (NSSM) and National Security Directive Memoranda (NSDM). Reports to Congress are available from the Public Papers of Presidents archive here or here. I have found no documents called national security strategy (NSS) or basic national security policy (BNSP). The pattern in this administration is to direct a foreign policy review annually by National Security Study Memorandum (NSSM). Each NSSM provides a list of areas (e.g., Southeast Asia) and functions (e.g., arms control) for review. The practice was to deliver to Congress an annual report on foreign policy produced by the annual review. (Perhaps there was also a more expansive written report.) The policy statements for specified regions and functions are in individual National Security Directive Memorandum (NSDM). Less frequently, the administration directed a military posture review. The foreign policy statement has more the flavor of national security strategy, while the military posture underwrote foreign policy objectives. An authority on the Nixon administration and Watergate offers an interesting take on the neoconservatives working against Nixon inside the Nixon administration, html, particularly in ACDA. Nixon entered office after campaigning to end the war in Vietnam, and quickly initiated a military posture and balance of power review. NSDM 27 US Military Posture, 1969,10,11, pdf. Ford presided over North Vietnam’s military takeover of the South without a US response. He directed a post-Vietnam defense policy and military posture review. Some of the reports stemming from NSSM 246 and leading to NSDM 348 can be found here. The Nixon administration was frustrated with a poorly integrated foreign economic policy, with various agencies vying for lead, as reflected in the following memo. Report not yet found, searching. The Reagan administration is the first to produce a glossy, unclassified strategy document for public distribution as per Goldwater-Nichols legislation. Subsequent administrations produced strategy documents in similar format.